Manuscript, Derbyshire, Chatsworth House, Book of Lismore; s. xv/xvi; 198 folios; c. 37 by 255 mm; scribes Aonghus Ó Callanáin and at least two other anonymous scribes; origin perhaps the Mac Carthaigh house at Kilbrittain, Co Cork. The MS is acephalous (missing 42 folios) and lacunose. It is a patron's book, written for Fínghin Mac Carthaigh Riabach (died 1505) and his wife Caitlín (died 1505? ), daughter of Thomas, Earl of Desmond. The Codex was at the Franciscan Friary of Timoleague when it was used by Míchél Ó Cléirigh to copy the Life of St. Finnchua, as stated in a colophon dated 20 June 1629. This colophon is printed by Stokes in Lives of the Saints from the Book of Lismore p. 348. The Codex was kept at Kilbrittain and came into the possession of Richard Boyle, first earl of Cork during the Irish civil war in June 1642, before it disappeared from view. It was rediscovered in Lismore Castle in 1814 in the course of building works and transferred from Lismore to Chatsworth in 1930. Contents: Dígal fola Críst [acephalous fragment]; Lives of the Irish saints (SS Patrick, Colum Cille, Brigit, Senán, Finnian, Finnchua, Brénainn, Ciarán of Clonmacnoise, Mo Chua of Balla); hagiographical anecdotes; Acallam na senórach; In tenga bithnua; Gabháltas Shéarluis Mhóir (Ps-Turpin); Sdair na Lumbardach; translation into Irish of the Book of Marco Polo; Suidigud Tellaig Temrach; Airne Fíngein; Caithréim Cellacháin Caisil; Forbhais Droma Damhghaire; Tromdámh Guaire; Acallam bec; miscellaneous anecdotes and poems. There are two important copies of this MS (i) Dublin, RIA, 477 olim 23 H 5; paper; s. xix (AD 1839); scribe Eoghan Ó Comhraidhe (Eugene O'Curry); a facsimile transcript from the mutilated original, made for the Royal Irish Academy, and collated by John O'Donovan; (ii) Dublin, RIA, 478 olim 23 H 6; s. xix (AD 1868); vellum; scribe Joseph Ó Longáin; executed for the Royal Irish Academy. R. A. S. Macalister (ed. ), The book of Mac Carthaigh Riabhach, otherwise the Book of Lismore. Facsimiles in Collotype of Irish Manuscripts, 5 (Dublin 1950). With descriptive introduction and indexes by R. A. S. Macalister. In his Facsimile edition, R. A. S. Macalister gives a detailed account of earlier literature about the Codex, a summary of its history prior to its rediscovery in 1814, and refers to Eugene O'Curry's account of its history after 1814 in Lectures on the Manuscript Materials of Ancient Irish History (1861) 196–200. (Read O'Curry's account). He also quotes an article by J. T. Collins, Journal of the Cork Hist. and Arch. Soc. 52 (1947) 88–90. Collins draws attention to two letters (preserved in the Lismore Papers, vol. 5, second series, p. 79) by Lord Kinalmeaky addressed to his father, Richard Boyle, first earl of Cork. The first letter is dated 3 June 1642 at Bandon. In it, Lord Kinalmeaky describes how the men of Bandon under his command captured Kilbrittain Castle, the residence of Mac Carthaigh Riabhach, who then owned the manuscript. In the second letter, dated 25 June 1642, Lord Kinalmeaky writes: "I present your Lordship with a manuscript found at Kilbritten." This marks the Codex's transfer to Lismore. In July 1643 Lismore was attacked by Confederate forces under Lord Muskerry, but not captured. As the manuscript was found walled up in 1814 during building works, it has been suggested that the Codex was hidden from an enemy attack such as this. Macalister thought, however, that the manuscript was not hidden in a wall at that time, but in 1745, as someone using the manuscript noted the year '1745' on a page, possibly to calculate a date relating to a story in the Codex. (1) Preliminaries; A History of Israel. (2) Lives of Saints (3) Anecdotes (4) The Ever-new Tongue (Tenga Bithnua) (5) Poems (6) The Conquests of Charlemagne (7) Anecdotes (8) A History of the Lombards (9) Marco Polo's Travels (10) Miscellanea, chiefly relating to Diarmait mac Cerbaill (11) The Book of Rights (12) The Victorious Career of Ceallachán of Caiseal (13) The Siege of Druim Damhgaire (14) Miscellanea (15) Imthecht na Tromdáimhe (16) Agallamh Bec, Agallamh na Senórach. Brian Ó Cuív wrote on the manuscript, 'Observations on the Book of Lismore', in PRIA 83C (1983) 269–292. In connection with the Book of Lismore Exhibition in summer 2011 at the Glucksman Gallery, UCC, the booklet 'Travelled Tales–Leabhar Scéalach Siúlach', co-written by Máire Herbert, John Carey and James Knowles was published to provide background information and bibliographic details. Prior to Macalister's edition, the contents were described by Whitley Stokes in the Preface to his Lives of the Saints from the Book of Lismore (Oxford 1890), pp. v–xliv. A shortened form of Stokes's description follows below, with omissions marked [...]. vellum, 15 1/2 inches by 10 1/2 inches. There are on average forty lines in each column. The only ornaments are the initial letters with which some of the pieces commence. These letters exhibit the Celtic interlacement, but have no colour, except in two or three cases, where they have been reddened by an unskilful, and apparently modern, hand. The handwritings of three scribes can be distinguished: one of whom was a friar named O'Buagachain, another calls himself Aonghus O'Callaid. All of them were more or less careless and ignorant. They often omit marks of aspiration, sometimes even words. They constantly write gh for dh and dh for gh. So they write mh for bh and bh for mh. They use the digraph fh not only for the aspirated f[dot], but for the medialized f (bh-f). They use the digraph ts, not only for the eclipsing t (t-s[dot]), but for the aspirated s (s). The manuscript has lost at least thirty-six leaves, and of those that remain, many are more or less illegible owing to fading, damp, or the re-writing of an ignorant person called O'Floinn, in whose hands part of the book appears to have been in the year 1816.
fo. 1 a, col. 1 (old foliation .f. xxxu.). Beginning of an Irish homily on the Life of S. Patrick, printed infra, pp. 1–19. fos. 3, 4 (old foliation, .f. xxxui and .f. xxxuii). Continuation from fo. 1 of the Homily on S. Patrick. Two leaves are here lost. fos. 5, 6 and 7 a. The remainder of the Homily on S. Patrick. Fo. 6 a is numbered in an old hand xxxxi. fos. 7b–11 a, 1. Homily on the life of S. Colomb cille, printed infra, pp. 20–33. Folio 8 a is numbered in an old hand xxxxuii. fos. 11 a, 2 (old foliation xxxxui)–16 b, 2. Homily on St. Brigit, with the hymn Brigit bé bithmaith and the preface thereto. Printed infra, pp. 34–53. Folio 12 a is numbered in an old hand xxxxuii. fo. 17 a, 1–23 a, 1. Homily on S. Senán son of Geirgenn. Printed infra, pp. 54–74. fo. 23 a, 2. Life of S. Findén of Clonard. Printed infra, pp. 75–83. fo. 25 b, 2–30 a, 2. Life of S. Finnchua of Brí Gobann (now Brigown). Printed infra, pp. 84–98. At the end is the following scribe's note: In brathair o Buagachain roscribh an betha so as Leabhur Mainestrech Buiti 'the friar O'Buagachain wrote this Life from the Book of Monasterboice. Folios 27 a and 28 a are respectively numbered in an old hand lxii and lxiii. fo. 31 b–35 a, 1. Homily on S. Brenainn son of Finnlugh. Printed infra, pp. 99–116. fo. 35 a, 2–39 b, 2. Homily on S. Ciarán of Clonmacnois. Printed infra, pp. 117–134. At the end is a note in the handwriting of O'Buagachain, complaining of the MS. which he was copying. fo. 39 b, 2, line 10. Two short prose pieces and a poem in eleven quatrains, printed infra, pp. 135, 136.
fo. 40 a, 1–42 b, 1. Homily on S. Mochua of Balla. Printed infra, pp. 137–146. fo. 44 a, 1. Story of S. Patrick, Loeguire's queen, his son Lugaid and the archangel Michael. [...] Similar legends are in Rawl. B. 512, fol. 108 a, 2, and fo. 143 a, 2. Other copies of this legend are in Lebar na hUidre , p. 116, in Rawl. B. 512, fo. 141 a, 2, and in some MS. (to me unknown) cited by Dr. Todd ( Lib. Hymn. , p. 87). The LU. copy is printed and translated infra, p. 304. Other copies of this legend are in the Book of Leinster , p. 284 a, Laud, 610 (in a note on the Calendar of Oengus , June 17), and Rawl. B. 512, fo. 141 b, 1. 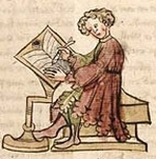 The copies in the Book of Leinster and Laud, 610, have been published, with translations, the one in Goidelica , p. 1 80, the other in the Calendar of Oengus , p. cv. A complete copy of the poem recited by the Devil is in the Book of Ballymote , p. 256 a, where it is said to be taken from the (lost) Book of Glendalough (Lebar Glinne da lacha sin uili). Two of the quatrains are in the ninth-century Irish MS. in St. Paul's Kloster, Carinthia. See Goidelica , p. 177, and Irische Texte , p. 319. There is another copy of this story in the Book of Fermoy , fo. 51 a, 1.
fo. 45 b, 2. A short note about S. Baithín son of Brenann, Adamnan's Baitheneus, St. Columba's first cousin (clann da dearbbrathar iat andís). Another copy is in Rawl. B. 512, fo. 142 a. This curious composition is a dialogue between the sapientes Ebreorum and the spirit of Philip the Apostle, who is called by the household of heaven the 'Evernew Tongue,' because when he was preaching to the heathen, his tongue was cut out nine times, and was nine times miraculously restored. In answer to questions by the wise Jews, the Evernew Tongue tells them about the creation of the universe, and especially about certain seas, wells, rivers, precious stones, trees, stars, etc. ; and it, lastly, describes hell, doomsday, and heaven. fos. 48 a, 49 a, 50 a, 51 a, 52 a, are respectively numbered in an old hand, lxxxiii, lxxxiiii, lxxxu, lxxxui. There is another copy of this poem in Laud 615, p. 15, where it is ascribed to S. Colum cille. It will be remembered that Charlemagne is said to have been the first pilgrim to the shrine of S. James of Compostella. See Gaston Paris, La Littérature Française au moyen Age , section 34.
fos. 60 a, 61 a are numbered lxxxxu, lxxxxui; fo. 64 a is numbered lxxxxuiiii. Compare the piece entitled Fagail na Samna in the Bibliothèque Nationale, Celt, et B. 1, fo. 15 b, 2. Another copy in Egerton 92, fo. 26, has been published with an English translation by Mr. S. H. O'Grady, in Mélusine , tom. iv. cols. 163–166. There is a third copy in the Book of Fermoy , fo. 57 a, 1, and the latter half occurs in Rawl. B. 512, fo. 144 a, 1.
fo. 69 b, 2. Note in nine lines about a monk who came from the East. This piece, which is founded to some extent on Paulus Diaconus' Historica Langobardorum , and which, in fo. 75 b, 2, cites 'Torpinus espug' (bishop Turpin), ends imperfectly on the verse of fo. 78, (f. ll.x.iii. of the old foliation), with a passage about the death of Hugo de Sancto Victore, A.D. 1138. Dr. Petrie ( Ecclesiastical Architecture , p. 369) quotes from fo. 77 b, 1 the beginning of a story about Conrad the Salic and the Emperor Henry III. fo. 81 a is numbered in an old hand l.l.x.u.iii (i.e. 118). It contains two poems, one (fo. 93 b, 2), beginning: 'Atconduic aislingi olc,' (I saw an evil vision), the other (fo. 94 a, 1), 'Mairg thachrus fri clerchib ceall' = Mairg thochras ri clerchib cell, Book of Leinster , p. 149 b, Mairg thachrus re cleirchib cell, Laud 615, p. 15 (Woe to him who contends with clerics of churches) a poem ascribed to King Diarmait after he had been cursed by two saints. This story is also found in the Book of Leinster , p. 358, left margin. See, too, The Martyrology of Donegal at April 5.
fo. 94 b, 2. Account of the death of Diarmait, son of Cerball, when he wore a shirt made of the flax of a single pod (léne óenruaissni) and a mantle made of one fleece (d'oluinn oenchaerach dorónad), and when he had on his table ale made of the malt of one grain (coirm óengrainde), and the bacon of a pig that had never been littered. This, too, is an extract from the Aided Diarmata maic Fergusa Ceirrbeoil . This poem is found also in Egerton 92, fo. 9 a, 1: in the Book of Leinster , p. 147 b, where it is anonymous; and in Laud, 610, fo. 72 b, 1, where it is entitled: Fingen cecinit do Cormac mac Cuilen[n]ain. fo. 95 b, 1. Poem on the same subject, beginning: Cert gach righ co reil . do clannaib Néil nair. Other copies are in the Book of Leinster , p. 148 a, and the Book of Fermoy, fo. 33 b, 2, where it is ascribed to Fothud of the Canon. O' Curry, Manners , ii. 176, says it was addressed to Aed Ordnide, overking of Ireland from A.D. 793 to 817.
fo. 98 a 1–104 b, 2. A copy of the Book of Rights , of which an edition by O'Donovan (from the Books of Lecan and Ballymote) was published by the Celtic Society in 1847. The Lismore copy is preceded by the tract on the tabus and prohibitions of the Kings of Tara, Leinster, Munster, Connaught, and Ulster, also found in Egerton 1782, fo. 35 a, 1. In the Book of Lismore , the Book of Rights (Lebar na Cert) begins at fo. 98 b, 2. The Testament of Catháir Mór ( Book of Rights , ed. O'Donovan, p. 192–204) is omitted. S. Patrick's blessing (ibid. p. 234) and Dubthach's decision as to the rights of poets (ibid. p. 236) are in fo. 104 b, 2. The tract ends (fo. 104 b, 2) with the poem (in thirty-four quatrains) beginning Teamuir teach i mbui mac Cuinn (ibid. pp. 238–250). The verse begins: Nonbur sin sil Conuire o nach berur ní ndeoluigh. glory (wind, smoke, sleep and a flower): on the worst sin (pride); and the greatest good (humility). There is a facsimile of this page in Gilbert's National MSS. of Ireland , Part iii, No. lvii. There are poems on ff. 112 b, 2; 114 a, 1; 114 a, 2; 114 b, 2. The tractate breaks off in the middle of the second column of fo. 115 a.
fo. 115 b, was left blank by the old scribe. On the upper half one Donnchadh O'Floinn has written an Irish note dated 1816.
fo. 116 a. A poem in forty stanzas, written across the page and beginning: Ni téd anégen anaisgidh . fo. 116 b. Two-thirds of the first column are occupied by two short pieces obscure to me. Caitilin ingen an iarla (Catherine the daughter of the Earl, i.e. Thomas, eighth earl of Desmond) is mentioned in 1. 4. The second column is blank. Crinna, 7 legthar roimh in croissi an cuid-sin di. The story breaks off in the second column of fo. 120 b. The scribe notes: Andiaigh an catha so dod láimh dheis ata an chuid ele don echtra so Thaidhg meic Cein, uair hi [fdot]uarus a n-aoinecht re scribad hi. fo. 122 b, 2, lower margin. A quatrain beginning Atach Dé ar teithed na tond. This story (of which there is an older and better copy in the Book of Leinster , p. 106) has been imaginatively balladized by the late Sir Samuel Ferguson in his Lays of the Western Gael , London, 1866.
in bhfhuil uaibh nech no imluaidh? ar an forbhais d'foiridhin, et cetera. The prose begins thus: Na dá triuchad roboi an tir sin suil tucadh hi do Mhogh Ruith, 7 ocht tuatha a ngach triucha, et asi so roinn in da triucha sin .i. mar ghabus glaisi muilinn Mairteil i Sleib cain 7 Loch Luingi ar an machaire 7 Gleann nanDibergach ar Monaidh Moir. fo. 141 b, 2. A poem in thirteen stanzas beginning: Truag Caiseal gan Cormac / righphort na slógh salmgrad. fo. 142 a, 1. A short tract on the destruction of the nobles of Ireland by the vassals, led by Cairpre Cat-head, and the disastrous consequences. See O' Curry, Lectures , pp. 230, 262–264, 590. Another copy is in Laud 610, fo. 112 b, 3, where it is attributed to Adamnán. It is a copy of the story called Scél saltrach na muice ('The tale of the Pig's Psalter') preserved in the Book of Fermoy , fo. 42 b. This story has been edited with a translation by Owen Connellan in the Transactions of the Ossianic Society , vol. v. Dublin, 1860.
or (7) a withered stick broke under his foot, or (8) he failed to stoop under a branch as low as his knee, or to leap over one as high as his ear, or (9) he failed to pluck a thorn out of his heel with his nail without interrupting his course. A year for the stake. Three years for the field. Three lifetimes of the field for the hound. Three lifetimes of the hound for the horse. Three lifetimes of the horse for the human being. Three lifetimes of the human being for the stag. Three lifetimes of the stag for the ousel. Three lifetimes of the ousel for the eagle. Three lifetimes of the eagle for the salmon. Three lifetimes of the salmon for the yew. There is a poem, in ten stanzas, on the relative length of life of a stake, and a field, of man and other animals, in the Book of Fermoy , fo. 98 b; and Mr. S. H. O'Grady has pointed out to me two short notes dealing with the same matter, one in Egerton, 118, fo. 51 a, the other in Egerton 133, fo. 229 a. The note in Egerton 118 resembles one in the Book of Ballymote , p. 14 a. Furthermore, from the tale of the transmigrations of Tuan (LU, pp. 15, 16), it may be inferred that the Irish of the eleventh century held four of the oldest animals to be the stag, the wild boar, the hawk, and the salmon. The Welsh had similar traditions. See the Mabinogion , ed. Guest, ii. Compare also Aristoph. Aves , 610, and Auson. Idyll. , xviii. Professor Cowell (ubi supra) quotes two Buddhistic legends, in one of which the animals whose ages are compared are a partridge, a monkey, and an elephant, and in the other, a vulture and an owl. See also Mr. Rhys Davids' Buddhist Birth-stories , 1880, vol. i. p. 312; the Demaundes Joyous , imprinted ... by Wynkyn de Worde, 1511, and reprinted by Wright and Halliwell, Reliquiae Antiquae , vol. ii. p. 75, ll. 3–15; seven letters in The Academy for Oct. 27, Nov. 3, and Dec. 1, 1888, pp. 274, 291, 356: Pamphilus Gengenbach , ed. Gödeke, s. 562–564; and W. Wackernagel's Kleinere Schriften, iii. 186. A similar monster is mentioned in the Life of Brenainn, son of Finnlug, infra pp. 109, 255. Other vellum copies of this composition, which well deserves to be edited, are in the Bodleian (Rawl. B. 487, fo. 12 b et seq., and Laud 610, fo. 123 a, 1–fo. 147 b, 2), and in the Franciscan monastery, Merchants' Quay, Dublin. All are more or less imperfect. Its contents are analysed by O'Curry, Lectures , pp. 307–312, and extracts from the Lismore version, foll. 166 a, 166 b, are given ibid. pp. 594–597. fo. 198 is a leaf of discoloured vellum added by the bookbinder, with a small fragment of the codex (about 3 1/2 by 2 inches) inlaid on the recto. This fragment, which is much faded, seems to contain the beginnings of six quatrains. The words 'Na tab . . . Deich . . . gidh mor . . . Suid(iu)gud . . . senchas. Aírmeim . . . Eintriucha i crich Connacht . . . Coic triucha dec', are legible. Four pieces mentioned by O'Curry ( Lectures , p. 200) as contained in the Book of Lismore I did not find. They are: 1. The story of Petronilla, St. Peter's daughter; 2. 'The discovery of the Sibylline oracle in a stone coffin at Rome;' 3. An account 'of some modifications of the minor ceremonies of the Mass'; and 4. An account 'of the correspondence between Archbishop Lanfranc and the clergy of Rome.' Nor does the MS. contain a Life of S. Finnbarr, as stated in the Introduction to O'Curry's Manners and Customs , i. cccxxii.